Project Dyane – HubNut – celebrating the average! Dyane: For sale. Project Over! I’ve tried to sell pretty much every vehicle I own in the past month or so, with varying degrees of success. The Honda should soon be off to a new home, though I’ve decided to keep the XM for a bit longer yet. It’s so good at so many different things, though I have tried to destroy the clutch by accidentally soaking it in diesel. This is a bad thing to do it turns out. Slippy! Dyane must make way for the 2CV project. Unfortunately. 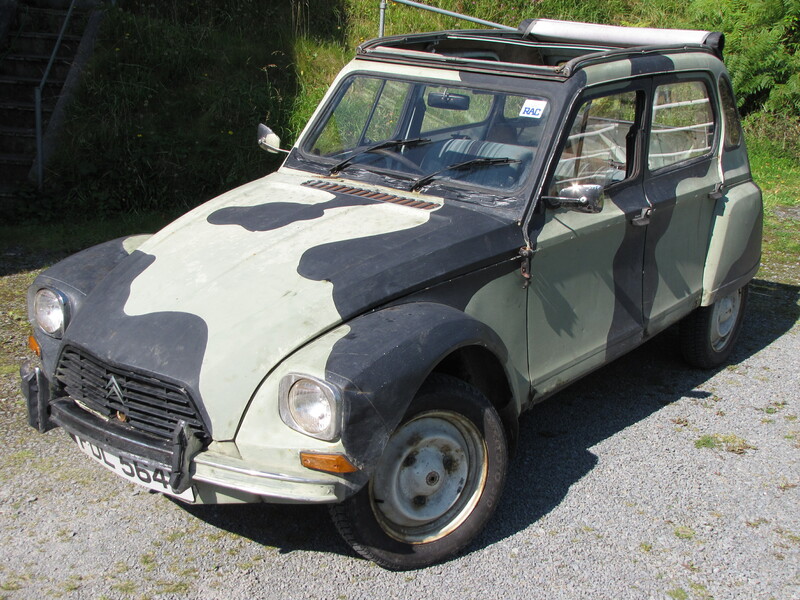 But this post is to highlight the fact that my extremely eye-catching (camouflage fail) Dyane is now up for sale. I’ve had a really enjoyable time steadily improving this machine, but it still needs further fettling, and I need to focus my energies on the 2CV. There’s a fair bit I need to do to the chassis before the body comes back, and I don’t have anywhere to do the work. There’s room for only one aircooled Citroen in my life! I put the Dyane up for £1200, but £1100 would take it if I can get a sale this weekend. Obviously, I may be open to a part exchange, though this really is a fund raiser, as well as a space maker. I think another reason to get rid of the Dyane is that I could really start to like it very easily indeed! The Dyane is so much better than a 2CV in so many ways. I love the extra elbow room, the practical hatchback, the rear seat that’s actually comfortable to access and the doors that don’t flap at speed. 2000 miles on the clock (so at least 102,000). Engine overhauled with replacement barrels and pistons. Sale includes new windscreen and seal relating to the above. Engine uses Boyer Bransden points-assisted ignition. Project 2CV: Ready to go! It’s been a fantastically beautiful day here in Wales – bendigedig! Sunshine helped ease the sorrows of yesterday’s Six Nations rugby match. Before I get to the 2CV, let’s have a quick look at the other aircooled Citroën in my life. Camouflage Dyane out for a hoon. I do love driving the Dyane. It’s a complete attention magnet. I’m still having to take it slightly easy after the winter engine rebuild, but I can still get a shift on. 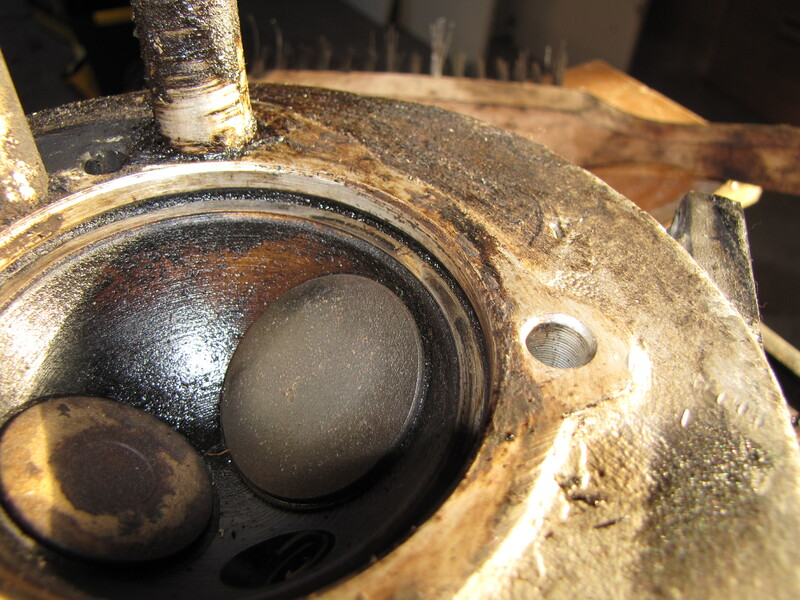 There is still work to do on this engine though – the cylinder heads are still whiffy. Ah well. At least I found something nice to park next to in town. Wow! Second C6 I’ve spotted this week. Dutch plates, RHD. Yes, a Citroen C6. On Dutch plates no less, though it was a right-hand drive example. It’s the second C6 I’ve spotted in a week – I was following one for a time on Tuesday as I hurtled to Coventry and back in the XM. Speaking of the XM, it’s got another mega-mile week ahead. The 2CV’s bodyshell is ready for transport! XM ready for some haulin’ action. It’ll be a long old slog to Bradford and back tomorrow, thankfully featuring rather more major routes than Tuesday’s cross-country dash to Coventry. It should be pretty relaxing given a maximum of 50/60mph depending on road type. I’m looking forward to Alan’s assessment of what needs to happen and can finally discuss exactly what needs to happen. Of course, the focus for the time being is on the bodyshell. But it isn’t quite as simple as getting it all welded up again and refitting it. Some panels are too rusty to just bolt back on, so will need to be replaced. 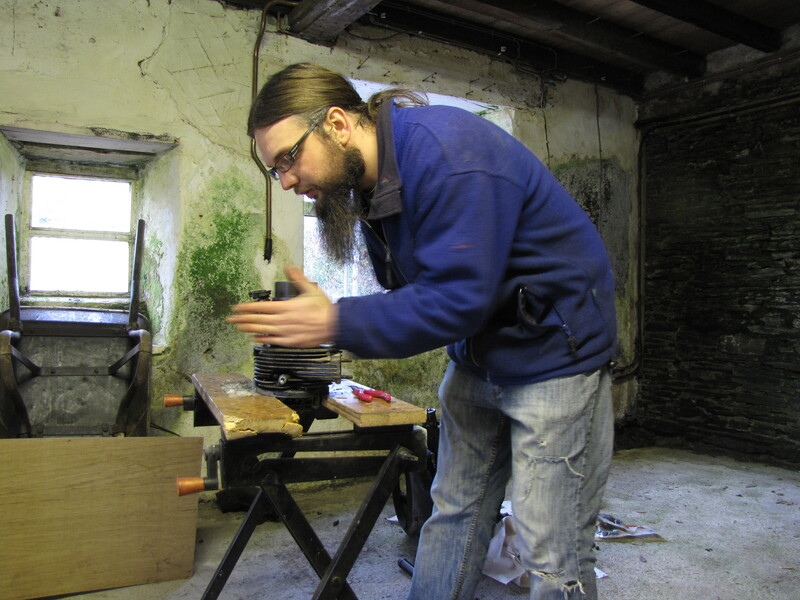 Others need a certain amount of fettling – doors and bonnet especially. Then there’s the running gear. I really do need to go over it while everything is so accessible. I’ve got a seriously sticky carburettor linkage to deal with, and very rusty suspension cans. I also need to replace all of the wheels and tyres. So, plenty of expense yet to come and while your contributions have made this project feasible, I can see that the Dyane is still going to have to go at some point. That was always the plan – the Dyane was meant to be fill-in until the 2CV was back on the road. I have grown rather fond of it though. But, two projects (for the Dyane needs welding too) is just too much to consider at the moment, so when the 2CV is closer to returning to the road, the Dyane will have to go. Until then, I hope to have plenty of fun in it. Let’s hope for lots more sunshine! I’ve already talked a bit about having the Dyane back on the road, in this post. But here’s a proper video update, that also includes footage of my day out with the Herefordshire Wye Knots 2CV group. Project Dyane: Back on the road! With all the excitement about Project 2CV, I’ve rather overlooked the poor Dyane. There’s good news. The Dyane is back on the road! As you’ll recall, it has undergone a minor engine rebuild over the winter months. For a while, it felt I’d never get the job completed. Every time I fixed one problem, I discovered another. What really spurred things on was a visit to Sparrow Automotive, where the ever patience Pete took time to dig out a set of barrels and pistons and even honed the barrels and fitted the pistons ready to fit. You can do this on a 2CV as the gudgeon pin sticks out from the barrel just enough to fit it to the piston. Pete then also dug out a pair of driveshafts and even fitted new gaiters to them. He then produced an embarrassingly small invoice. Thanks Pete! The Dyane remains a project with no budget at all (and no, I won’t be using 2CV funds on it). Look who’s up and running again! I’d never dismantled an engine to this degree before, and I found it utterly fascinating to do. It’s actually very simple indeed once you know how to release various clips. I did allow the rings to slip out of the barrel on one side, and had to dash to the next village to borrow a ring compressor, but it all went well. This was back in January. I ran the Dyane up the driveway to find a horrific oil leak, as related in my previous post. As it happens, recent work for Retro Japanese magazine saw me passing ECAS 2CV Parts, so I was able to pick up a new cupro-nickel oil feed pipe. Pleasingly, fitting this seemed to render the engine oil tight at long last! The Dyane was ready to return to the road. Stupidly, I decided to wait until March before taxing her again, but then the Wye Knots 2CV group in Herefordshire announced a road run. Temptation proved too much, so the Dyane was taxed, and off we went! I was quite nervous, and took far more tools and parts than I normally would. I needn’t have worried though, as the Dyane ran very nicely indeed. I was having to take things easy, to allow the new engine parts to bed in. Mind you, it wasn’t long before I was just refusing to slow down for bends. Conserved momentum means less strain on the engine, surely? On the downside, I’m sure labouring up all the hills around here hasn’t been kind to the engine, and the cylinder heads still smell a bit leaky. I’m hoping a retorque will help. It’s due after 1000 miles, but having but a few heat cycles through that engine now, I think I’ll just do it anyway. Sadly, I’ve had to postpone some much-needed welding work on the Dyane. It needs the lower windscreen panel replaced. Unfortunately, I blew the pot of money I was going to use for that on a Honda Prelude... If anyone would like to buy it for £545, I would be very grateful! And so would the Dyane. Incidentally, the XM is no longer for sale. It seems that disaster is never far away with the engine in my Citroen Dyane, yet somehow it manages to avoid catastrophe and just keep going. Somehow, this car got me home from Wiltshire when I bought it despite the ignition timing being too advanced, the oil cooler and cooling fins for the barrels being caked in filth and remnants of a carrier bag further impeding airflow. This is what you get when you decide to drive 140 miles in a car that has spent most of the past few years sitting in a field after years of field use. I sorted all that out and then drove it to Sussex and back for the Goodwood Revival in September of last year, and it turns out I was luckier than I thought. Aside from the idle disappearing at times, the Dyane was trouble-free on that trip. Even when I twice managed to almost run it out of fuel! Yet work of the winter highlighted that actually, the engine may have suffered a partial seizure at some point, caused by overheating I suspect, especially given the issues contained in the second paragraph of this piece. Even more remarkable, it turns out that there may have been a very small fracture in one of the small diameter pipes that feeds oil to the cylinder heads! I know that because having had to move said pipe to remove the cylinder head, there’s now a slightly larger fracture in the oil feed pipe, and oil is peeing out at a goodly rate. So, I’m giving in. I do actually need to spend some money on this car. I’ll be purchasing new cupro-nickel oil feed pipes, which hopefully won’t rot in quite the same way, and I’m adding some much needed rubber pipes into the mix too, for the breather and carburettor – both pipes go to the air filter. I still maintain that I’ve been lucky though. If one of those oil feed pipes fractures while you’re hurtling along a motorway, you may not know it until the oil has left your engine and it has seized up entirely. Certainly, all this work has confirmed that I was right to take the Dyane off the road for the winter, and while it’s disappointing that my plan to have it back on the road for February has not come to fruition, I can at least take comfort in the fact that the weather has generally remained awful, and the best place for this car is probably in my garage! The Dyane has spent most of the past few months with its front end missing. There will be further expenditure in the future too. The front brake discs look a little ‘lippy’ for my liking, both headlamps have lost some silvering, and there’s the big welding project to replace the lower windscreen panel – hopefully taking place next month. Unsurprisingly, this car has required a fair degree of improving. There’s arguably no bigger gamble for the classic buyer than a project that has been left sitting, especially if it has been left sitting in the elements. It could have been much, much worse though and I’ve really enjoyed the process of steadily making it better. Since I bought my first 2CV in 1996, I’ve used aircooled Citroens throughout the year – apart from 2002-2003 when Elly was in pieces during a restoration. When the second phase of that restoration was completed in late 2005 to January 2006, I celebrated by immediately driving her from Lincolnshire to Aberystwyth at the height of winter. The Dyane will be going sleepy times this winter. And, you can see the results for yourself. Elly the 2CV is now rotten as a very, very rotten thing indeed. So, I’ll be taking the Dyane off the road this time. I attempt to explain myself in this new video.